Step 1. Grab a ruler, some paper and a pencil! You'll want to write all of this info down. Step 2. 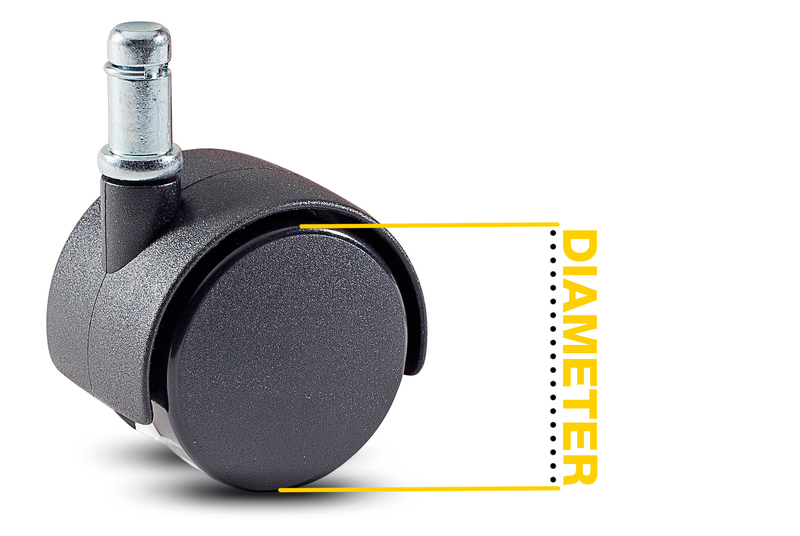 Identify and measure the caster's mounting type. 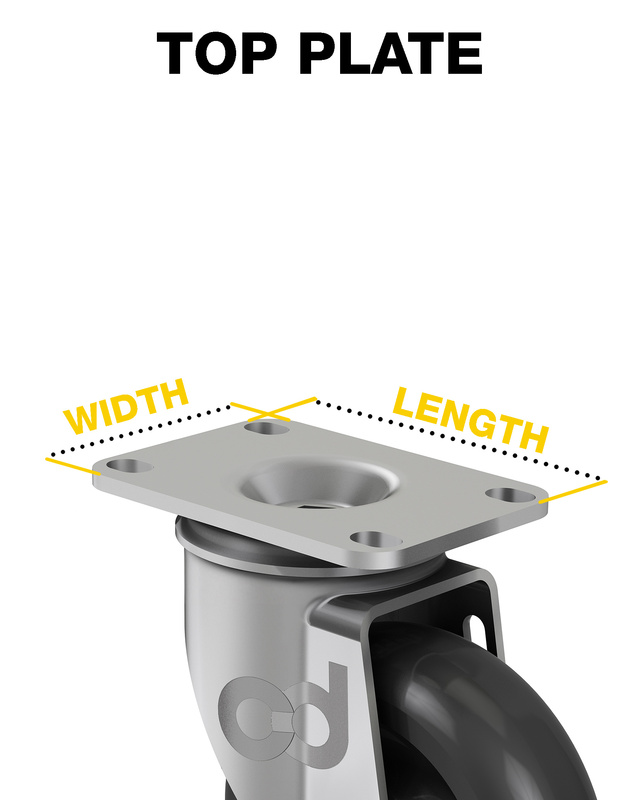 The first thing you'll want to write down is the type of mounting used by your twin wheel caster. See the below images to help you correctly identify and how to measure your twin wheel's top plate or stem using your ruler. 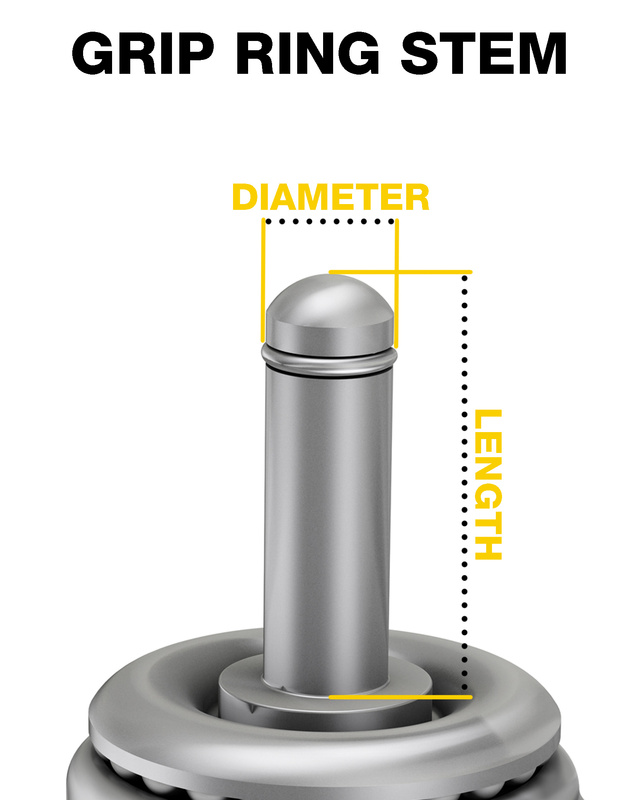 If you are replacing a grip ring caster, we HIGHLY suggest using a caliper or thread checker to measure its diameter because the two most common grip ring stem diameters are different by only 1/16". 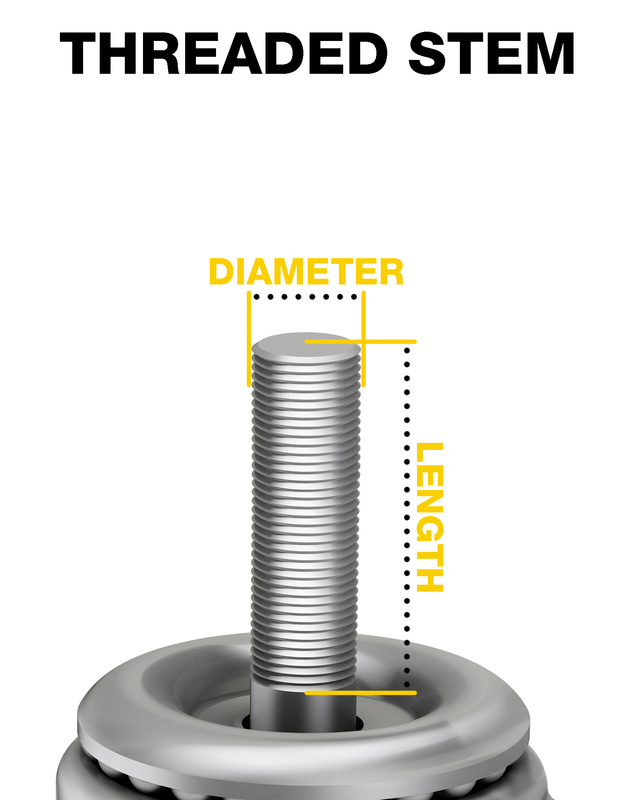 Helpful hint: sometimes threaded stems are measured using the metric system! Step 3. Find the wheel size. 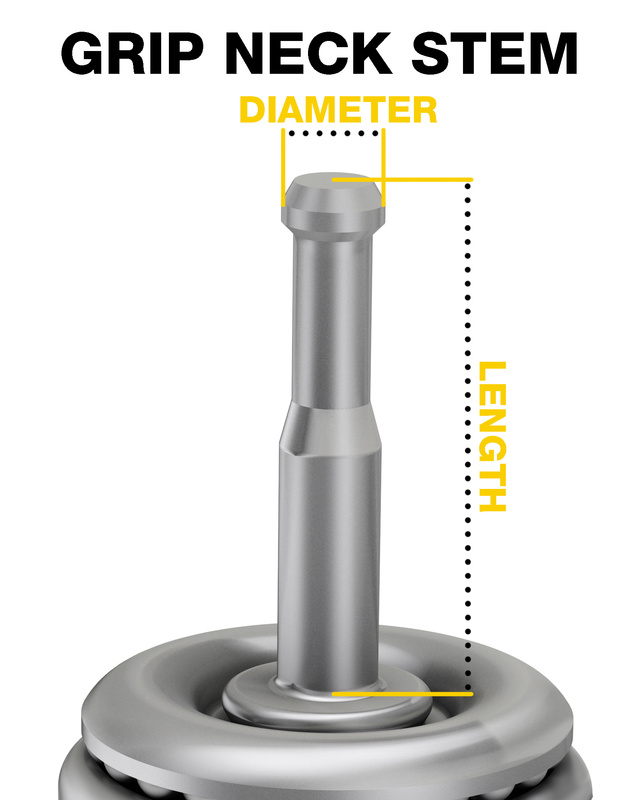 The next important measurement of a twin wheel caster is the diameter of its wheel. A wheel's diameter can be measured by finding the distance between any two points opposite one another across its face. Helpful hint: the wheel's face is the part of the wheel that does NOT roll along the ground. Also, please note that twin wheel casters have wheels that are typically measured in millimeters, not inches. We suggest writing down both measurements. Step 4. Determine the wheel's tread material. Standard twin wheel casters normally have a nylon wheel with nylon tread, but some have a urethane tread. 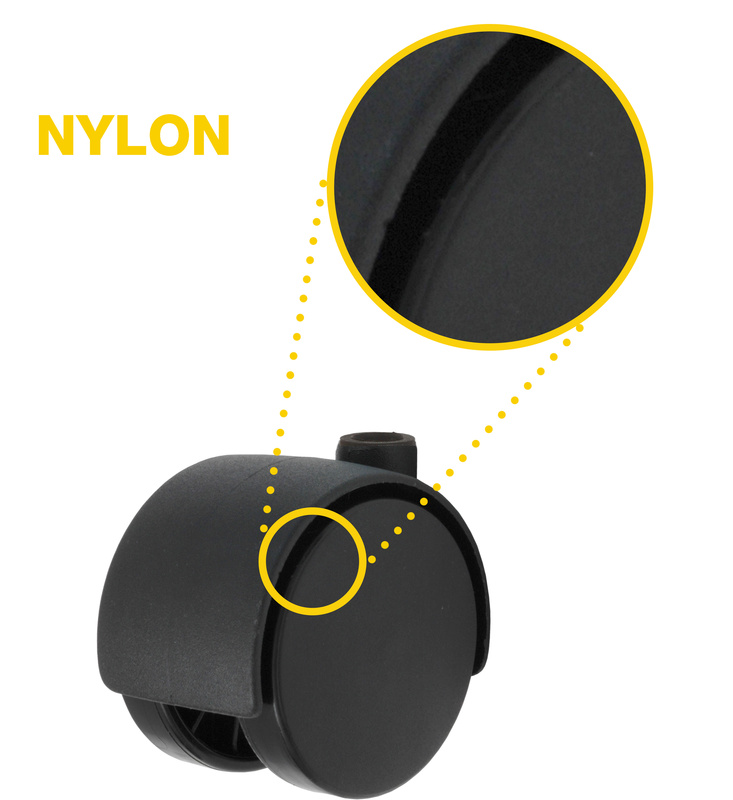 Nylon wheels are almost always used on softer surfaces, like carpet. 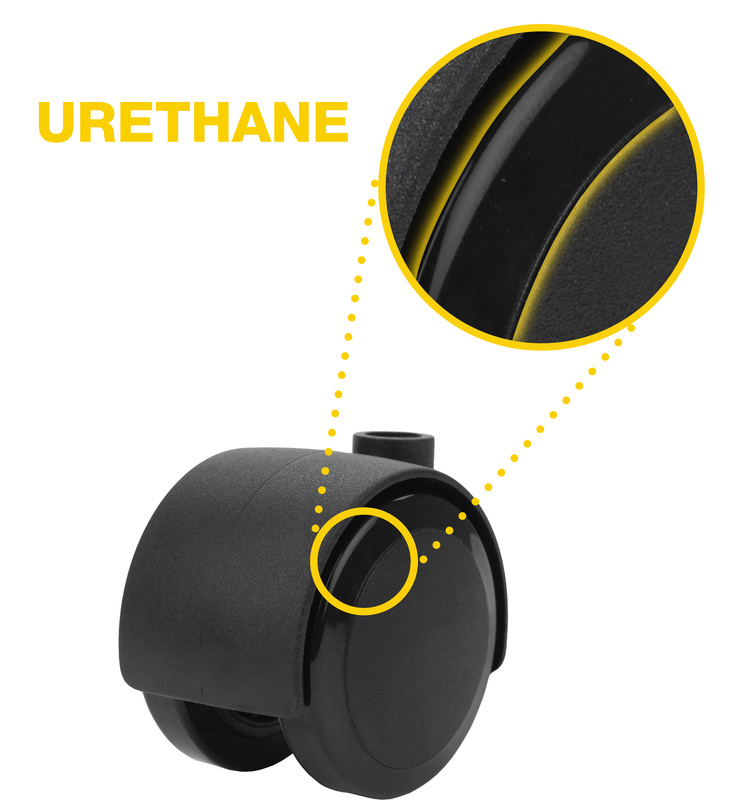 Urethane wheels are almost always used on hard surfaces, like wood or tile. But, which do you need? Grab that pencil and use its tip to try to dent the tread of the wheel. Helpful hint: the wheel's tread is the part of the wheel that rolls along the ground. Was it fairly easy to make a dent? If it was, you've got a urethane wheel. Nylon wheels will not dent easily. ...still unsure? Take a close look at the wheel. Is the tread somewhat shiny? Or does the tread look like it is made of a different material than the rest of the wheel? If either of these are true, you are replacing a twin wheel caster with a urethane wheel. Step 5. Count how many casters you need. PLEASE count! Helpful hint: Most office chairs have FIVE twin wheel casters, not four. Step 6. Determine other important details. What color is your caster? Does the caster you are replacing have a brake on it? Is your twin wheel caster hooded or unhooded? Helpful hint: hooded casters have an additional piece of material covering about the top portion of the wheel. Step 7. 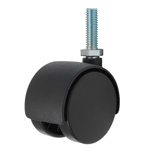 Find your replacement twin wheel caster on our website. 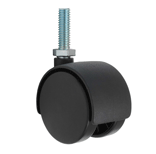 To find your twin wheel caster replacement on our site, we suggest starting at our Twin Wheel Casters page. From there, click on the "Mounting Type" filter on the left side of your screen and select top plate or stem. If it is a stem mounting, filter by stem type (found directly under "Mounting Type") once the page has refreshed. Next, use the "Wheel Dimensions" filter to enter your wheel diameter. If you don't see an exact match for your wheel diameter, select the closest option. Don't worry about the wheel's width. Helpful hint: you can change the inputs from decimals to fractions or metric measurements! Using the "Wheel Tread Category" filter, choose the category your caster's tread falls into. Finally, use the remaining filters for the other important details you noted about your twin wheel caster. You should now be looking at your twin wheel caster. Pat yourself on the back and smile. That wasn't so bad, was it? ...Go wrong somewhere? Can't find your twin wheel caster on our site? Let us help!